Think of the adventure through the maze of bones within the body of an invertebrate. Or imagine searching through rocks for some long ago creature. Shubin took his students on a search and found the first vertebrate to walk on land. How long has it been since you played Hide and Seek? Good hiding places were not hard to find but the seekers soon found them out. Remember the thrill when the seekers came close and you could jump out and frighten them? The ongoing opposition to Charles Darwins theory of evolution is looking for a safe place to hide. Hiding from our animal nature. Science has proven so many things and the latest fact that amazes me is that our bones, every detail of our bodies, is written in a single cell. Sounds impossible. What I was going to be  physically, that is  was in the DNA from which I came long before I was a gleam in my Daddys eye. So it is with each and every one of us. There are many explanations in research studies where we can read how many disciplines came together to figure it all out. 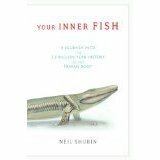 A book with the unlikely title YOUR INNER FISH by Neil Shubin is an easy read about how archaeologists, paleontologists, and the patient lab workers pick apart the genes to come up with the beginning of us all. Three hundred million years ago before the first critters moved about in the waters the stage was set so to speak. Now I thought the associations of the seemingly unrelated scientific disciplines was strange enough to make me scowl at the thought of being able to understand any of it. Well I was wrong. The search for fossils sounds unnecessary but Shubin got me curious about the gap between some forms in evolution. Somewhere he hoped to find a missing link between water animals and land animals. It is now well known. The search and how it relates to each digit on our hand and every spot on the jaguar is a real enlightenment. Why do I have five toes? Why does my cat have six? Read adventures of chipping away at ancient rocks. Doesn't sound like much fun to me but here is one college professor who tells an interesting story with humor and good science. Find your connection to all vertebrates. An easy read. Your Inner Fish  A Journey into the 3.5 billion-year History of the Human Body. Neil Shubin, 2008, Random House.